"Till now in 70 years, they are not able to build a road of 30 kilometres but have promised us the moon. They have also rationalised petrol and diesel in the valley. The road from Ramban to Banihal has been closed for six days. If the situation continues to prevail, people might not get vegetables also. This government totally failed to fulfil their promises,' Farooq told reporters. After PDP chief Mehbooba Mufti, Farooq also lauded Pakistan Prime Minister Imran Khan for sharing his ideas of developing a nation at the Dubai Summit recently. "I agree what Imran Khan said in Dubai. He said that in order to develop a country there is a need to uplift all sections of the society rather than a particular class," Abdullah said. A day earlier, Mehbooba too had hailed Khan's decision for announcing to rename Baloki Forest Reserve in Pakistan after Guru Nanak, the Sikh community's holy figure and expressed his wish to build a university in his name. Continuing with his appreciation to what the Pakistan Prime Minister said at the Dubai Summit, Abdullah noted, "This government (BJP) has failed to develop the country after coming to power in 2014. They are not able to fulfil their promises". "The government claims that each and every village of India now has electricity. I urge you all to please visit my state. We don't have electricity in the major cities, forget about the villages," added the former chief minister of Jammu and Kashmir. In his concluding remarks, Abdullah accused the BJP of doing vote-bank politics. He said, "In order to win the elections, the BJP is creating divides among Muslims, Hindus as the elections are just round the corner. Minister of State (MoS) in the Prime Minister's Office (PMO) Jitendra Singh accused National Conference leader Farooq Abdullah and other Kashmir-based politicians of "speaking in the language of Pakistan" when they were out of power. "I have said this before that since decades, it has been the tendency of Kashmir-based politicians that they call Kashmir an integral part of India when in power and raise questions on the identity of Kashmir and begin seeing positivities in Pakistan when their governments are out of power," he said. Singh added: "This is not restricted to only one party PDP, National Conference has shown the same character. 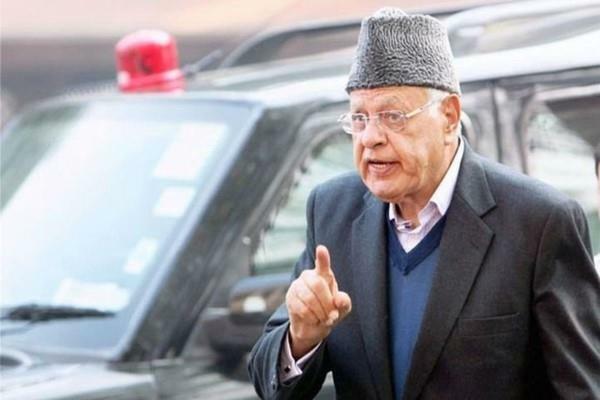 When Farooq Abdullah was the chief minister, he used to complain to the Centre that why are terror camps in (Pakistan-administered) Kashmir (PaK) not bombed? We all know what he is saying now when he is not in power."